The painting was painted in 1870. This canvas in a completely typical impressionist style. We see a woman and a man, who are depicted against the backdrop of lush greenery. They walk in nature. A man gives a woman a hand, as if to help quickly overcome a certain obstacle, which for us remains completely invisible. It is believed that Alfred Sisley posed for this painting by Renoir. Rafa, who was the beloved of Maitre, a famous musician and patron of the arts, acted as a female model. Spectators and lures in this magnificent magnificence of greenery. So it seems that funny birds are chirping, there is an incredibly light breeze. We feel the special aroma of the summer day, when magnificent flowers smell breathtakingly, the gentle sun shines and the rich herbs rustle. The palette of the artist in this creation is incredibly bright. Each stroke is as light as possible. It seems that he is incredibly lively, truly vibrating. 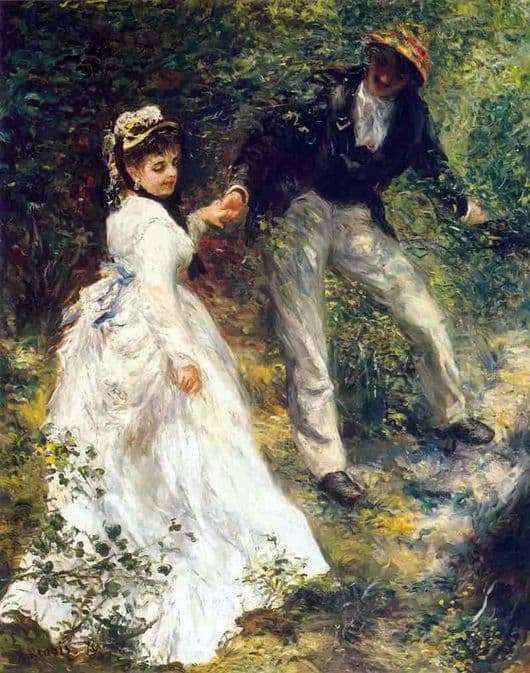 Renoir portrays absolutely random episodes, which snatches from ordinary life. At first glance, these moments are not remarkable. They are completely simple and ordinary. But it is precisely in this simplicity and ordinaryness that the true charm and special beauty lies. All paints used by Renoir are incredibly colorful and as warm as possible. The viewer feels a certain volume of the picture and the fullness of a special light atmosphere. Every detail is incredibly significant, and together they create a magnificent picture of a wonderful summer walk. Not only the faces of the characters, but also the smallest details of their clothes and the surrounding nature are masterfully written. Each brush stroke of the artist emphasizes the special beauty of the summer and fills the entire canvas with a special volume. It is like a living and tangible. The viewer can feel this special life and enjoy such an unusual and at the same time incredibly simple and quite familiar splendor.